It's been said that there's no force in the universe more powerful than the love of one robot for another, especially when said robot is in possession of a rocket-powered hoverboard. Perhaps it's only been said by me, but it's a statement that may one day prove disastrously true. Until that dark day we have Roboto, platforming proof of the lengths one tiny mechanical man will travel in order to win the heart of his lady-bot love. 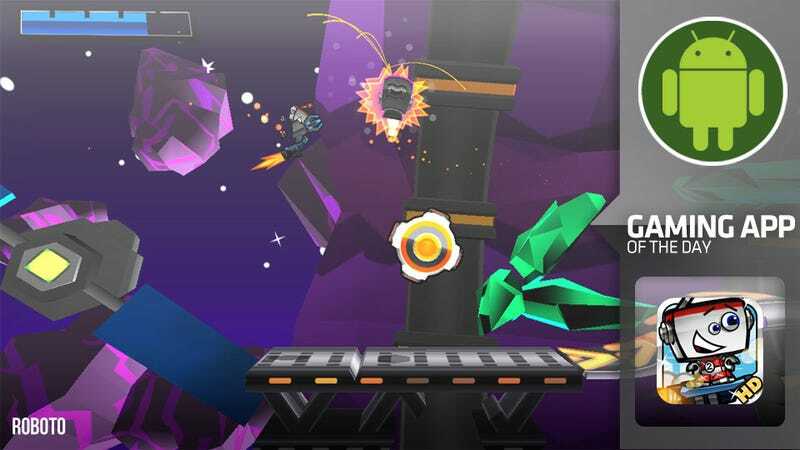 Recently released on the Android Market and iTunes (I played it on the Motorola Xoom) from Fenix Fire Entertainment, Roboto is a colorful side-scrolling platformer broken down into bite-sized chunks. The game begins when the machine-extreme hoverboarder Roboto catches glimpse of a tall cup of fembot with synthetic pink hair (I approve) jetting off into the galaxy aboard a spaceship. Obsession circuits kicking into overdrive, he launches into an intergalactic hoverboard spanning three worlds and 30 levels, all for the chance to ask her out on a date. Using touch screen controls to ride his board, perform jumps, and fire at enemy bots, Roboto grinds his way through each easy-to-digest level, launching off ramps, hovering across gaps, and collecting golden gears in order to keep his score at a healthy level. He'll also grab currency along the way that can be used towards purchasing new weapons and outfits. It may be a cute little game, but it's not without challenge. Roboto is constantly in danger of plummeting to his death or being smashed to bits by enemy machines. Learning each stage is part of the playing process, so players should expect their fair share of deaths. The levels are mercifully short, so continuing from either the beginning or the mid-level checkpoint isn't too frustrating, at least not the first five or six times, and it all becomes worth it once you meet your first massive, screen-filling boss. Roboto isn't without its faults. The mid-level checkpoint system needs to be tweaked so the collectible golden gears you score before reaching it aren't lost when you continue, the "punk" soundtrack is about as punk as Blink 182 (read: not very punk), and the 80's skateboarding terms are laid on a bit thick, but these are just tiny annoyances in a game that has made my smoke breaks highly entertaining for the past week. Fenix Fire believes in their little pal, so much so that the developer has posted a free browser-based PC demo of the game for folks to try out before they drop $2.99 in the Android Market (or iTunes). Give it a spin to see if you believe in robot romance.